Sri Aurobindo Education Society (SAES) was founded in 1964 to foster in the coming generations the art of living a life full of love, peace, joy and fulfillment, a life that is meaningful to them and beneficial to others. With this overall vision, among its first activities was the The Mother’s International School (MIS). Today MIS has 2,200 students, and has been ranked among the best schools of the country in several surveys. In 2014, it received recognition as the school with the highest average score in the Senior Secondary Examination conducted by the CBSE. 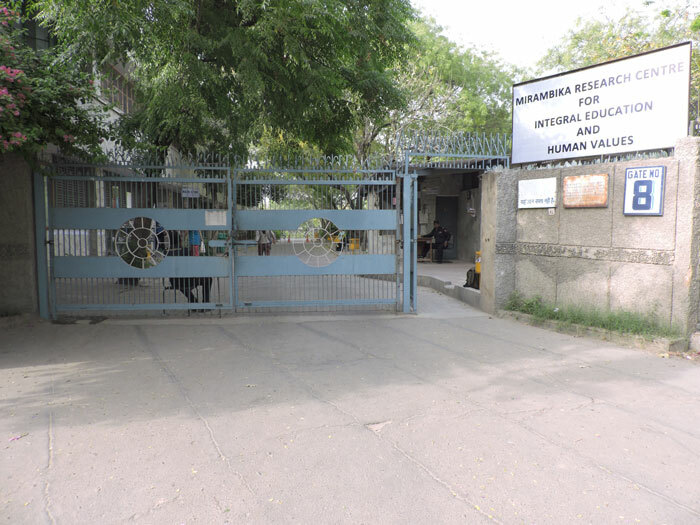 Mirambika, another educational institution run by the SAES, was founded in 1981. Mirambika is a teacher education institute, and has for the training of its students an innovative school with about 150 students. Mirambika has been repeatedly recognized as the top innovative school in the country, the latest being its ranking as India’s No. 1 Day school on the parameters of Life Skills Education, Conflict Management and Individual Attention to Students by the EducationWorld India School Rankings 2014. Mirambika also conducts certificate level courses on subjects such as teaching yoga, pre-school childcare, creative writing, storytelling, inclusive education, communication skills in English, personality enrichment, web designing, and Vedic Mathematics. In 1967, the SAES initiated a school of fine arts, Matri Kala Mandir (MKM). MKM conducts evening classes on the major classical Indian dances, instrumental and vocal music, painting, sculpture, and even martial arts such as Tae Kwando. These classes are used mainly by children of MIS, Mirambika and those studying elsewhere, but even adults wishing to learn these arts for self-expression and self-discovery are welcome. In 1989, the SAES started vocational training courses under the banner of Sri Aurobindo Institute of Vocational Training (SAIVT). SAIVT conducts 6-month courses on Carpentry and photo-lamination, Hand-made paper making and book binding, Cooking and bakery, Tailoring (only for girls), Computers and typing, and Library Science; and a 1-year course on Para-medical training. The vocational courses are used mainly by the under-privileged youth from all over the country. During these full-time residential courses, which are completely free, the students learn, apart from the trade for which they are admitted, English and computers; they play various games and sports for one hour every day, and meditate for half an hour every day. Apart from this they imbibe the habits of punctuality, discipline, and time-management. The present proposal is intended to expand the scope and activities of Mirambika to include a graduate level college of engineering and technology for women. Mirambika College of Engineering and Technology (MCET) will be an engineering college with a difference. As the students get technical education here, along the way they will also be inspired to strive for something higher than worldly success, to aspire for harmony of different parts of the being, and to work towards a life that is meaningful to them and valuable for the society. The college will have Undergraduate courses in Computer Science & IT. Sri Aurobindo’s integral philosophy is a life-affirming spiritual philosophy that takes into account the totality of the person. Integral philosophy forms the basis of integral education, the name often given to the system of education inspired by Sri Aurobindo and the Mother. This system looks upon the body, emotions and the intellect as instruments. Integral education not only seeks to educate these instruments for optimal function but also aims at making the student aspire to use them in light of our divine essence, the soul. Although these aims are far more relevant to school education, it is never too late to begin, specially when most students at college level also have never been exposed to this fundamental idea. This idea is truly fundamental because an instrument is like a knife. With the same sharp knife, one may chop fruits and vegetables, or stab somebody. Therefore, along with sharpening the instrument, it is also important to know how to use the instrument. It is our inner voice originating in the soul that provides us infallible authentic guidance on how to use our body, mind and intellect. Further, Sri Aurobindo has enunciated three basic principles of education, which have relevance to education at all levels. The first principle is that “nothing can be taught”. It is the student who learns, rather than the teacher who teaches. Unless the student is motivated and makes an active effort to learn, she can be taught nothing. That is why, in current jargon, we talk of the teaching-learning process rather than just teaching. The second principle is that “the mind has to be consulted in its own growth”. This principle appreciates the diversity among students. Each student has unique talents as well as weaknesses. A healthy system of education encourages the student in an area where she can excel. While this principle is more relevant to school education, even at undergraduate level, the student is sufficiently undifferentiated to benefit from this principle. The third principle of education is “to work from the near to the far, from that which is to that which shall be”. The efficiency of the teaching-learning process depends on the teacher knowing his students well, and starting with what they already know, what they are familiar with, what they are good at, before guiding them towards a pre-determined goal. The system of education based on the integral philosophy and these three principles was given a practical shape by the Mother up to the graduate level in Sri Aurobindo International Centre of Education at Puducherry. Sri Aurobindo has also said something, partly in jest but perfectly true and specially relevant to an engineering college. He says, “It would hardly be a good technical education for a carpenter to be taught how to fell trees so as to provide himself with wood and never to learn how to prepare tables and chairs … … the University says to him, ‘We now declare you a Bachelor of Carpentry, … … Go on, my son, the world is full of forests and, provided the Forest Officer does not object, you can cut down trees and provide yourself with wood to your heart’s content.’ Now the student who goes forth thus equipped, may become a great timber merchant but, unless he is an exceptional genius, he will never be even a moderate carpenter”. The need to relate technical education to the requirements of real life, which this passage brings out in a light-hearted and yet very effective manner, hardly needs any comment. Our first necessity … … is that the youth of India should learn to think … … to think independently, fruitfully, going to the heart of things, not stopped by their surface, free of prejudgments shearing sophism and prejudice asunder, as with the sharp sword smiting down obscurantism of all kinds as with the mace of Bhima. One knows well only what one has understood. Although the course will take a form, the form will be inspired by a considered and reasoned philosophy. While Sri Aurobindo and the Mother’s philosophy and views on education will be the guiding light, these will be adapted to suit a College of Engineering and Technology. The course will have a structure, curriculum, and system of assessment necessary to meet the requirements for producing competent graduates, and for this the three domains of education – cognitive, psychomotor and affective – will be adequately addressed through appropriate themes and topics in a reasoned sequence. But we expect our graduates to be different, and better, than what is the norm in the country because of the intangible elements that we shall build into our content as well as the tools of teaching and assessment on the basis of our guiding philosophy. Some elements of this philosophy have been summarized below. Students enter engineering colleges after going through a few years of hard work to clear entrance tests. Most of the questions in the entrance tests examine the candidates on factual recall. Hence the successful candidates are those who have good memories, and those who have further developed their memories through practice while preparing for the entrance tests. The preparation for the entrance tests, as well as the schooling that precedes it, hardly stimulate the higher faculties of learning such as comprehension, application, analysis, synthesis, comparison, critical thinking, original thinking, and reasoning skills. The result is that the student is a perfect sponge that can soak facts, but with very poorly developed faculties for application of knowledge, and still poorer abilities for generation of new knowledge. Although the higher faculties of learning should have developed in school, it is never too late to begin. We shall make our teachers conscious of adopting methods of teaching and assessment that would rekindle the spark of curiosity and creativity in the students. By the time they finish school, the majority of students start treating learning as a necessary evil for passing exams. That learning can be fun, that there can a thrill in exploring, is something that needs to be awakened by making the learning material interesting, and the methods of teaching interactive. By the time the student graduates, he should be a self-directed learner. Graduation should be the end of the beginning of the process of self-learning. Only through self-learning can today’s graduates keep pace with the rapidly changing world. No area of knowledge is an island unto itself, and no graduate can be considered truly educated without a comprehensive knowledge base. With this idea, the students will be exposed to talks on a wide range of subjects such as economics, management, history, culture, literature, and last but not least spirituality. They will have opportunities to learn the physical practices of yoga, as well as fine arts such as music, dance and painting. With other educational institutions on the campus already running, we have the resource persons and facilities readily available for a rich learning environment. The breadth that the students will acquire through such an education is particularly relevant to engineering graduates, among whom the current trend is to follow up graduation with an MBA and turn into managers. This is a terrible waste of technical education. With a deeper understanding of life and its purpose, our students might actually use their technical knowledge in what they choose to do after graduation. The traditional boundaries between areas of education suitable for men and women are crumbling, but opportunities are still geared to the old pattern. An analysis of students taking the CBSE examination shows that the number of boys taking the examination is approximately the same as that of girls, and the percentage of students with scores above 80 percent is slightly higher in case of girls than in that of boys. But the number of girls joining engineering courses is only ? as compared to ? boys, the girls forming a mere ? percent of the total admissions. It is to correct this iniquity to some extent that we wish to restrict the admission to the Mirambika College of Engineering and Technology to women only. The vision of Mirambika College of Engineering and Technology is to produce competent, socially conscious and spiritually evolved technical personnel who are well equipped for living a meaningful and fulfilling life rather than just for making a living.